Appraisal Day at the Museum! What? That Much! ALL APPOINTMENTS HAVE BEEN FILLED AT THIS TIME! 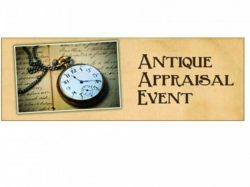 Three certified appraisers from DuMouchelles Art Gallery in Detroit will be at the museum on Saturday, August 25, 2018, from 10 a.m. to 4 p.m. to look over your historical items and antiques and give you a verbal appraisal of its value. The cost is only $5 per item and you can bring up to 3 items to be reviewed. Look through your treasures at home and in the attic — musical instruments, paintings, jewelry, figurines, vases, textiles — you name it, if it’s old, come see what it might be worth! However, you must make an appointment in order to have your items looked at so we don’t have a rush at one time or another! You’ll pay at the door on the day you come to see the appraisers. Arrive at least 15 minutes before appointment and come to the front door of the museum! Call Cynthia Given at 734-604-3859 to arrange your appointment.